The back part of the Inn was added to the original main house in the 1940s as apartments. 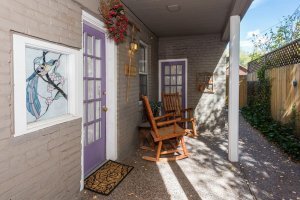 Walking along the north side of the Inn all the way to the back one finds Suite Nature’s patio with chairs. Entering the Suite one views the hand-hewn white pine queen-sized bed in the master bedroom. Bedside are two pine tables with lamps and an iHome clock radio. 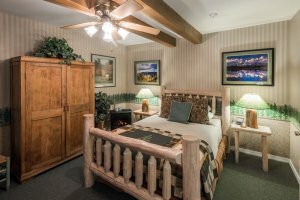 Large original photos of the San Francisco Peaks and pine tree wallpaper evoke images of this suite’s inspiration. 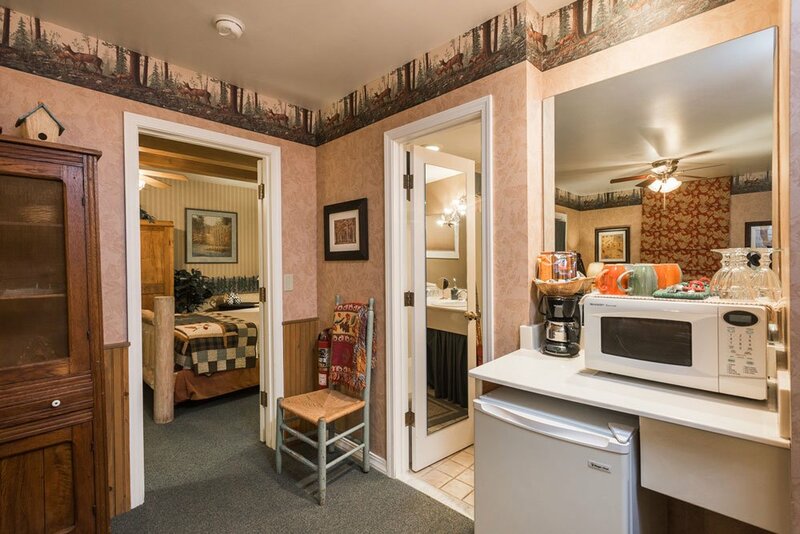 A large armoire encloses a small TV with DVD player for movie or cable viewing. 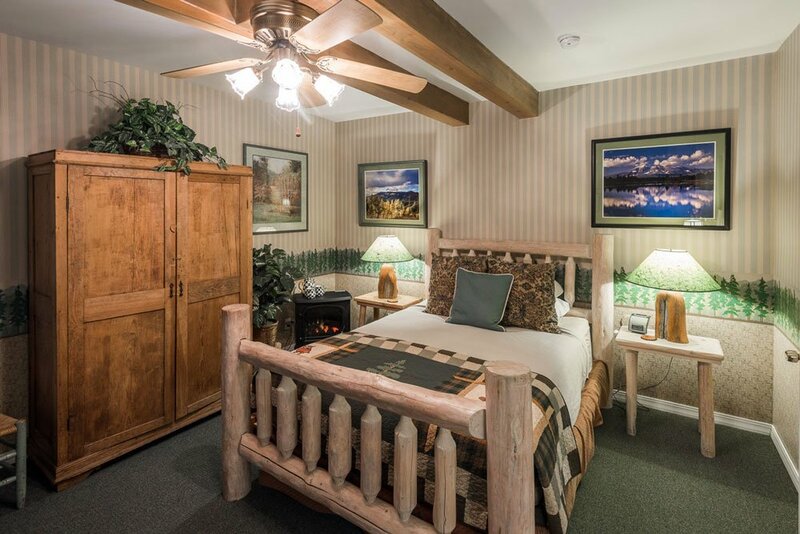 Adjacent the bed is an electric fireplace. 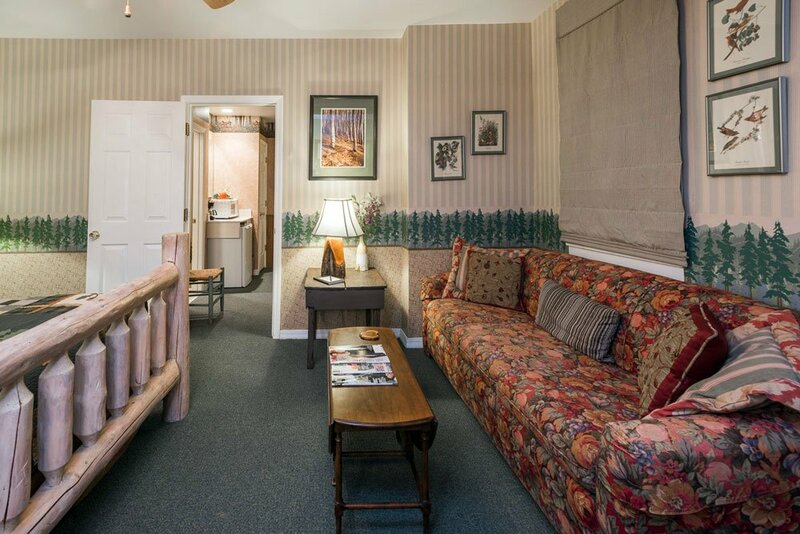 The master bedroom also features a sofa and coffee table with side table. 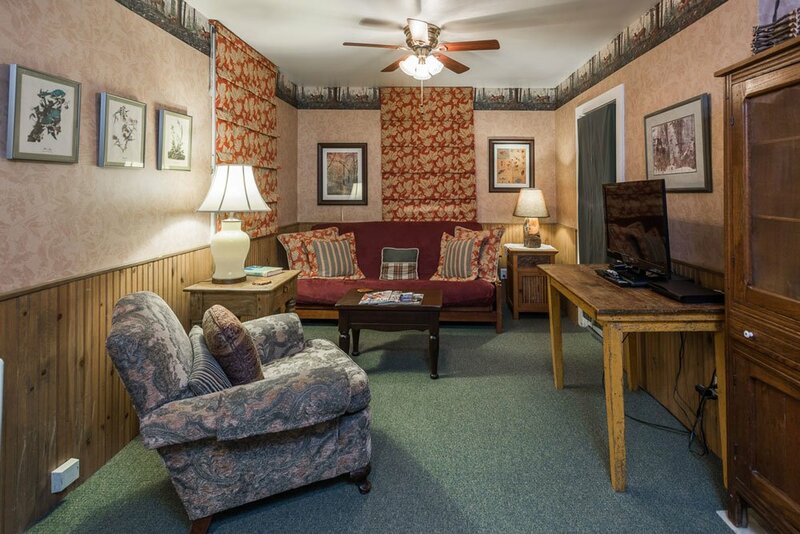 The suite’s second bedroom parlor contains a comfortable sitting chair with coffee table and lamp, an antique side cabinet and table with chair and a second TV for cable viewing. 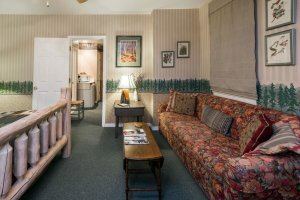 A full-sized futon sofa in the parlor sleeps one additional adult or child over 8 years of age. 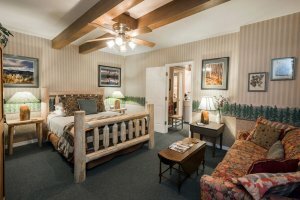 Heat in your room is provided by our circulating hot water system with British thermostat and Mitsubishi Quiet Air A/C with remote control is available for summer cooling as well as an overhead ceiling fan and a window fan. A coffeemaker with gourmet coffee as well as decaf, coffee amenities including all types of sweeteners and International Delight Vanilla creamer, coffee mugs, wine glasses, wine opener along with an in-room refrigerator and microwave are all included in Suite Nature’s coffee bar in the second bedroom parlor. An ironing board and iron are found in this room’s closet. 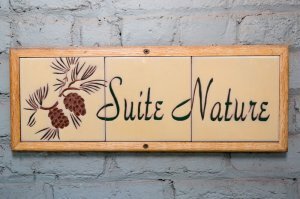 Suite Nature offers a modern generously sized bathroom with a tub/shower combination, one grab bar, and a cultured marble vanity. Four plush Vera Wang Turkish bath towels and hand towels and two bathrobes are available in the bath. 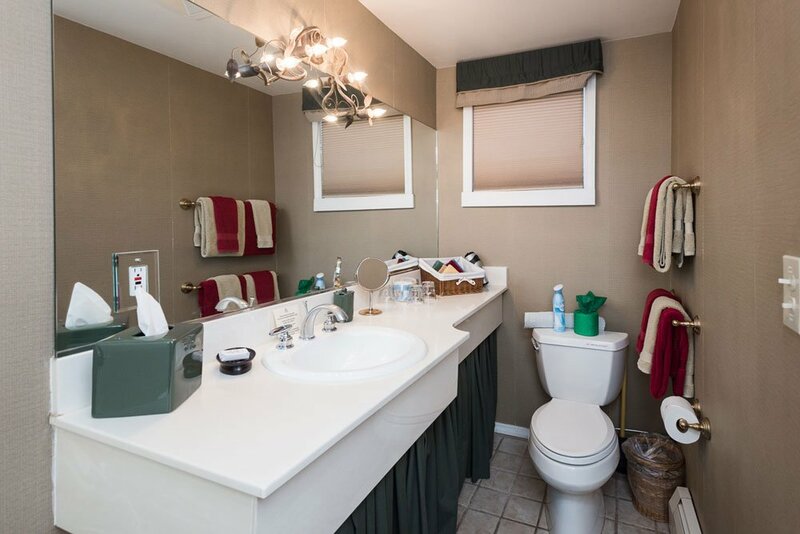 Hairdryer, makeup mirror, Gilchrist & Soames moisturizing skincare soap, body lotion, conditioner, and conditioning shampoo, along with our personal toiletry jar filled with makeup remover, Q-tips and cotton balls, round out your vanity offerings. 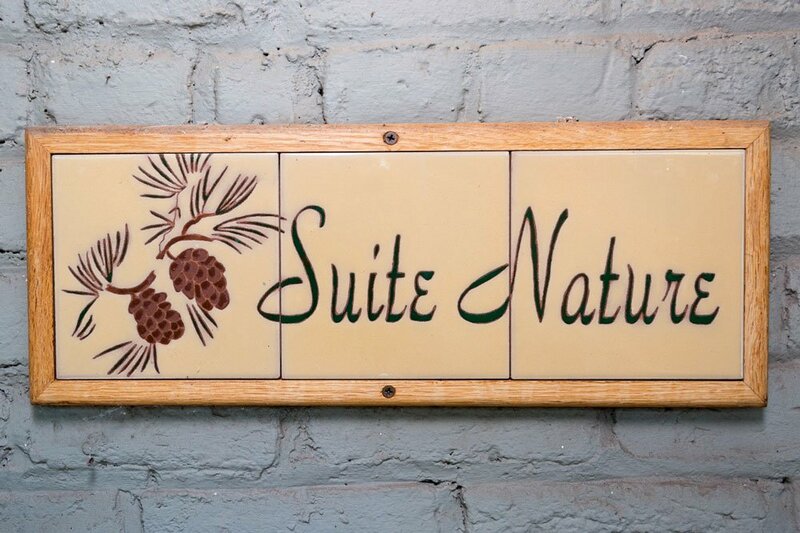 Suite Nature is ideal for couples or a family of up to 3 people for a week or weekend.